The EU has long frowned at China’s action in Africa for not requiring respect for human rights as a condition for aid and thus promoting a Chinese-inspired authoritarian Africa. But in recent years the EU has not been better, writes Fabian Wagner. Fabian Wagner is a former co-spokesperson of the Federation of Young Greens (FYEG). 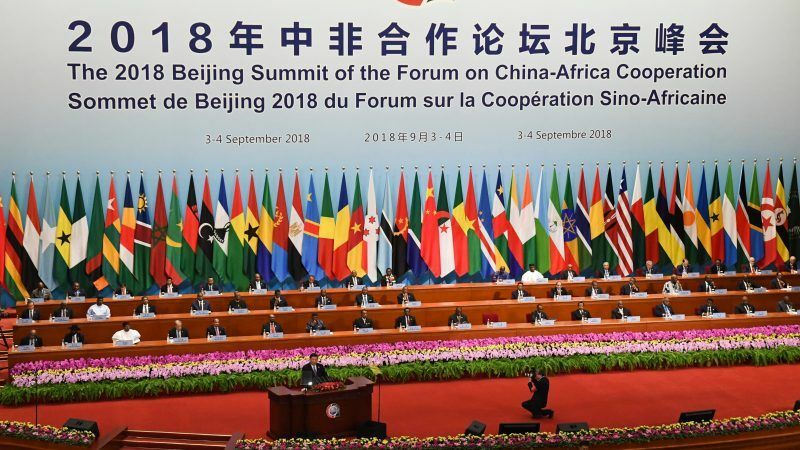 The European reaction to this summit and other instances of Africa-China cooperation is very interesting. News and politicians warn of a “new form of colonialism”. The main point of critique is that Chinese support does not require respect for human rights as a condition for aid and thus promotes a Chinese-inspired authoritarian Africa. With all this criticism, one could almost forget that it was not China that has been exploiting and destroying African social, economic and political systems for centuries, but Europe, and that support for dictators and tyrants does not come primarily from China, but from Europe. To stop refugees, almost no deal is too dirty for Europe’s liking, no government too cruel. China has been investing heavily in Africa for a long time. Whether in East, West, South or North Africa, there is barely any large infrastructure project on the continent that doesn’t feature the distinctive placards with Chinese characters. Roads in West Africa, conference centers in Rwanda, the shining new headquarters of the African Union in Addis Ababa, rails in East Africa: China invests everywhere. Indeed, human rights concerns are irrelevant. How would they matter? China itself is an authoritarian state that monitors its citizens at every turn and does not tolerate dissent. That the Chinese government does not criticise Ethiopia spying on its own citizens shouldn’t come as a surprise to anyone. The European “irritation”, or sometimes even “outrage”, in the face of these developments, however, is more than just bigoted. Europe’s heads of state and government regularly comment, as do European media on Chinese initiatives worldwide, including in Africa. Almost always there is a contrast between the supposedly “benevolent European development aid” and the “dangerous Chinese interference”. In development cooperation, governments like to point to strong checks and balances. “Do no harm” approach, “Impact Assessments”, even a manual for gender – development agencies are willing to present long lists of methods that allegedly avoid negative impacts on the project regions. The development agencies of many big Western governments even go beyond simply avoiding negative influences and pretend to work actively on the subject of “good governance”. Listening to these glossy presentations, one could almost be under the impression that European development aid promotes democracy and the rule of law in Africa. This impression is so far from the truth, you could almost call it malicious deception or how people use to say today: “fake news”. In truth, Europe is not afraid to work with even the worst regimes. Through programmes under the euphemistic label “fighting the root causes of migration“, support is given in various forms to regimes and governments which are no better than China when it comes to issues like human rights, press freedom or the rule of law – sometimes, they even outcompete China. Countries like, ”Africa’s North Korea” – the East African state of Eritrea – has been restituted to the rang of a project country in the context of anti-migration projects, after it has been a pariah for decades due to the incredibly cruel regime of President Afewerki. “Better Migration Management” with friendly support by Europe, now in a state, where young men are threatened by lifelong military service under miserable conditions, a state that is monitoring its inhabitants at every turn, shooting at people on the border, as they did back then in Communist Eastern Germany to everybody’s outrage, and threatening to jail entire families to extort from those who have fled the country. One of the main sources of income for the totalitarian regime is a “tax” it forces that way onto its citizens abroad, payable regularly at foreign representations of Eritrea. At the EU summit in Salzburg, Egypt has now been promised more support by the EU. Ex-General and now President al-Sisi’s military-backed dictatorship in Egypt –which brutally opposes the press, dissenters and LGBT and deteriorates further – was praised in Salzburg as a “particularly efficient” government that has proved itself capable of keeping back migrants. The NGO Reporters Without Borders called Egypt under al-Sisi “one of the world’s largest jails for journalists”. The human rights organization Amnesty International reports that Egypt faces a “human rights crisis” with hundreds of people tortured in military prisons, forcefully disappeared without a trace and extrajudicially executed, or collectively sentenced to death in mass convictions. Critical voices are systematically silenced with threats, travel restrictions and confiscations. This is the “particularly efficient” governance, that Europe today seems to value in its partners. The list of examples could go on and on. Morocco’s authoritarian regime is flattered and served at every opportunity, even though the country has not only illegally occupied Western Sahara for decades but also ranks among the lowest ranks worldwide in terms of press freedom and human rights. In Algeria, Angela Merkel recently visited the man who ruled the country for decades with an iron fist and despite extreme old age and illness apparently cannot step down from power. The main topic: the fight against refugees. In Libya, marauding pirates and murderous rebel leaders are quickly relabelled into the legitimate-sounding “Libyan Coast Guard”. The weak “unity government” (at times up to three rival governments in war-wracked Libya) is treated as a reliable partner in the fight against refugees – despite the shocking fact that German diplomats in leaked internal papers compare the unbelievably horrific and, in thousands of cases, deadly camps in the country with the concentration camps of the Nazis. Europe’s bulwark against refugees consists not only of barbed wire fences and concrete walls. Above all, it is a perfidious network of willing dictators, who do the dirty work for Europe, far away from the legal safeguards of the European states and the EU. Amongst these new “partners” of Europe, even the increasingly autocratic Turkish President Erdoğan resembles a “democrat”. Despite all that, Europe, in its sheer unlimited arrogance, seems unable to refrain from denouncing China’s practices as a threat to democracy and the rule of law in Africa. Yes, one can and must see China’s involvement in Africa in a very critical light. In a post-colonial world, however, it should be up to the people of Africa and China to evaluate and criticise (if they so choose) this commitment. It is up to us, on the other hand, as Europeans, to critically assess Europe’s engagement on our southern neighbour continent. This raises the question of what is worse: China’s ignorance of human rights abuses or Europe’s seemingly targeted cooperation with African regimes, which appears to have the motto: the crueller, the more effective it is in the fight against refugees. China is not the main source of support for brutal regimes in Africa, but Europe in its obsessive mania to keep refugees as far away as possible.